BBC1’s Watchdog screens a report on the phenomenon of the squeak that develops in the increasingly popular £110 Nike Air Max 95 reissue, complete with some withering commentary from Ann Robinson. Later that week, customers arrive at the Leeds Foot Locker store in St John’s shopping centre wielding their noisy purchases and demanding a refund. A riot ensues and somebody manages to hospitalise a copper in the sports shop brouhaha, leading to eight arrests. That memory makes us proud to be British. 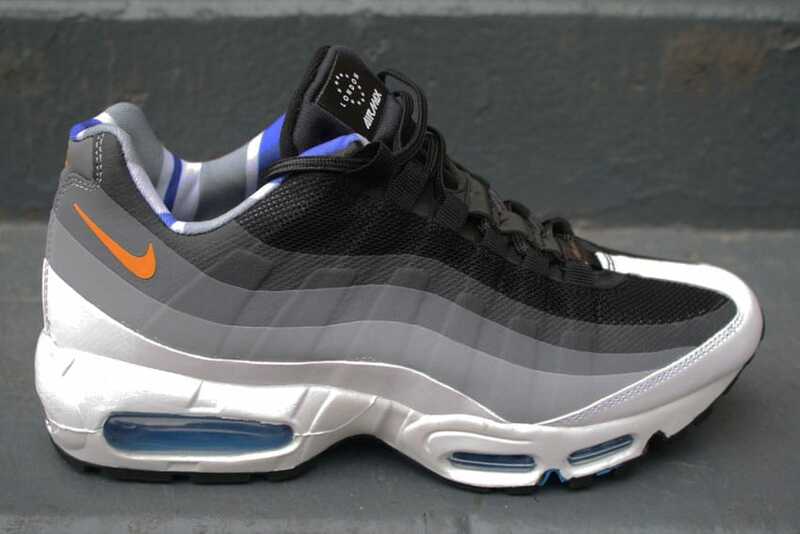 We have a relationship with the Nike Air Max 95 that seems to have been fostered by a wealth of SC editions from 1999 and 2000, with some particularly strong UK-only leather variations dropping at the new NikeTown store on Oxford Street, Foot Locker and JD stores to build on the existing rep the shoe carried. Expensive when it dropped at £100, the later £110 pricetag the retros carried made it an aspirational object back when Iceberg, Moschino and really, really overpriced Champagne in clubs was the steez of choice. We still know plenty of people that still refer to this shoe as the “110” which, confusingly, was also a nickname for the TN aka the Air Max Plus — another object of envy from the same era. We’d argue that the TN or 90 would be the definitive London Air Max silhouette, but the 95 deserves landmark status too — especially after it topped the Reebok Classic as the UK’s most common crime scene footprint (the Air Max LTD and TN came third and fourth) in the late 00s. Of course, that’s never going to be part of the official marketing materials, but we think it’s another indication that this shoe invaded UK culture (and houses and cars left unattended) in a serious way. Questionable associations aside, Sergio Lozano’s masterpiece is a force to be reckoned with when colourways are applied correctly and this Nike Sportswear HomeTurf Air Max 95 ‘London’ pays tribute to the nation’s capital with a colourway that evokes some past triumphs and was apparently inspired by our public transport. We haven’t quite sussed what this version of the ’95 actually is — there’s some Hyperfuse-esque no-sew overlays on the upper, but there’s also a more conventional piece of paneling in those white nylon overlays. If those muscle and tendon inspired gradients had been made of the traditional synthetic suede applications, or if it was different colours of Scotchlite to match the heel’s reflectivity, we’d be losing sleep over this shoe. Unfortunately they’re not, but the main colours and the orange swoosh making up for some of the oversights. In the Nike Inc. promo imagery, the linings were plain on the London pack — the production versions all have a Union Jack themed pattern inside that’s a bit Carnaby Street gift shop, but has a certain kitschy appeal. Is this silhouette still worth fighting over? We think so. It looks a little like a Euro-exclusive from back in the day and it would work with a grey tracksuit — we think that’s sufficiently London enough to justify the name on the HomeTurf London ’95’s box. These go on sale in the Crooked Tongues store on Saturday.